-In a large pot, heat the olive oil over a medium-high flame. Add the onion, garlic, chili powder, cumin, coriander & oregano. Sweat until the onions begin the turn translucent. -Add the black beans, chipotle chiles, butternut squash, tomato and vegetable stock. Season with salt and pepper. Bring the mixture to a simmer and add the bulgar. 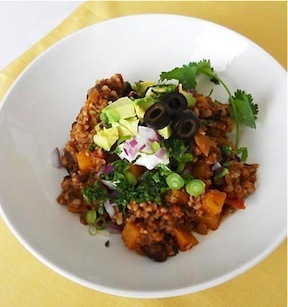 Allow the chili to cook about 30-40 minutes until the squash is tender and the bulgar to soft. Garnish with your favorite toppings. 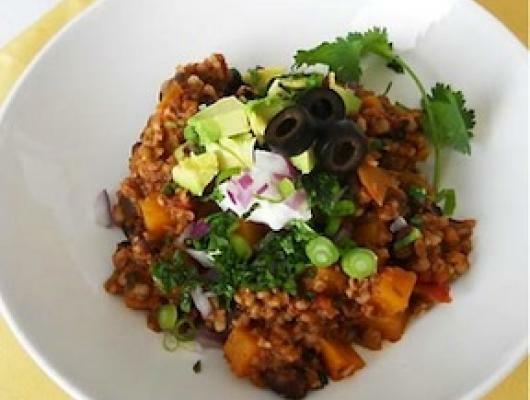 This chili is vegetarian but very filling and satisfying because of the addition of bulgar wheat. Don't forget to add your favorite toppings!